"The Committee is just a start", he said. "Other opinion shapers would also be involved to gather their views and perspectives". He assured that the Committee will probably form sub-committees and that these sub-committees will gather the inputs of socio-political bloggers and opposition members. Mr Tan's explanation of Mr Heng's remark is nothing new. Lim Yuin Chien, Press Secretary to the Ministry of National Development said in 2009 replying to letters to the Straits Times Forum asking why opposition members cannot be grassroots adviser said, "Opposition MPs cannot be appointed advisers, because they do not answer to the ruling party. They have no constitutional or legal obligation to carry out national programmes on the Government's behalf. Nor can the Government hold them to account if they perform this role unsatisfactorily." The PAP Government has been consistent in that sense. This National Conversation cannot be a grounds-up effort, it cannot be led by thought leaders, even parliamentarians from the opposition cannot be in the Committee (or even its sub-committees). 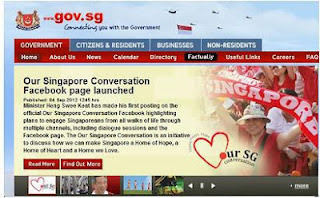 They can only be participants because this is a PAP Government initiative, and so, only the PAP can lead it. A real National Conversation can only happen against the backdrop of an uncontrolled media, unshackled civil society and political parties that are not oppressed. Mr Heng has also made it clear that this National Conversation is not about intentionally looking for sacred cows to slaughter, but it is about thinking of the kind of Singapore that they want in the coming years and how to get there. It is becoming quite apparent that this call for National Conversation by the PAP can only be a call to Singaporeans to have a more reasonable conversation with them, and more importantly on their own terms. To them, we are "cow peh, cow bu". To us, they are the "birds of a feather who flock together". "All crows under the sky are black" - even when they are MIWs.